But elderflowers, along with strawberries & cream, Pimms and picnics are an essential of the Great British Summer. Once you know what they look like, Elderflowers are really easy to spot. They emerge in big white frothy bundles on elder trees during early summer – and later in the autum the trees are covered in sprays of dark purple berries. Be on the lookout for an elder tree near you, because this stuff is seriously good medicine (and good eating.) Elder is used to treat zillions of conditions – from colds and flu, to hayfever, to skin irritations. Plus, it makes some seriously tasty drinks. This is one elderflower head. You need 20 of these to make cordial. You might remember we made this elderberry cordial. Not only is elderberry cordial a brilliant cold and flu remedy, it makes a yummy hot toddy, or just as a drink on its own, diluted with water. Now we’re making the summertime equivalent – elderflower cordial. But aside from the healthy goodness, elderflower cordial captures the taste of summer. Make some now, and keep a bottle on-hand for deepest winter when you need a bit of sunshine. This year, I used a recipe from Miles Irving (remember my Spring foraging weekend by the ocean?) It makes a really sweet cordial, so you only need a little bit to make a tasty drink. As Miles says, the most delicious cordial is made over a low heat, with lots of pollen-heavy elderflowers (so don’t rinse them first!) He includes citric acid in his recipe, but I left it out because … well, I just didn’t have any on hand. Now add the 20 flowerheads (short stems are OK, but pick off the leaves), and the zest and juice of the 2 lemons. Cover, and let sit for 24 hours. Using a cheesecloth or strainer over a large bowl, strain off the liquid. This is your elderflower cordial. Yum! Pour into sterilized bottles or freeze in small ice cube trays. Personally I keep a bottle in the fridge for use right now, and freeze the rest for the winter. Elderflower cordial, ready to drink! Apologies for the photo – it’s so hard to make a glass of liquid look interesting! As a drink – put 1-2 Tablespoons of cordial in a glass and fill with water. You can adjust the amount of cordial to taste. You can also fill with hot water and drink like a tea. I’ve also been using it to make elderflower martinis with gin … stay tuned for the recipe! 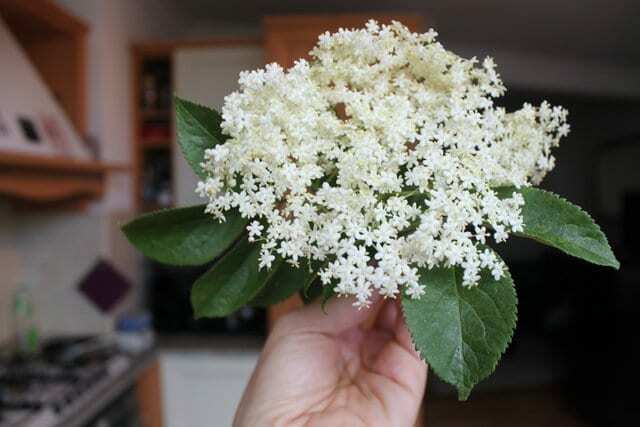 Have you ever made elderflower cordial? What’s your favorite way to use it? We don’t have elder TREES here in the States, but our native elderberry BUSHES (same family) are a common roadside plant. In fact, this was a very good year for our New England elderberries. It’s unfortunate that I didn’t see your posting until now, but all those wild elderberries are reaching peak ripeness right around now. The flavor’s not much to speak of if you eat them out of hand, but they come into their own when used to make wine, jelly, etc… Elderberry bushes are pretty easy to identify, but do your homework first, because there are somewhat similar looking berries (poke weed, for example) that are poisonous, so you don’t want to do any picking until you’re sure you’ve got the right bush. I need to find out if we have elder trees in suburban Boston – I have no idea! But, on vacation last week, I had the most delicious drink (well, more than one of them, lets be honest : ) made with gin and elderflower cordial. I’d love to be able to make my own. We make industrial amounts of cordial every year – they do become cloudy after a while, and there could be a few reasons. If the bottles weren’t sterilised or filled right up it could be mould, but it is more likely to be the pollen becoming suspended in the cordial. If its a yellowy colour this is what it likely is. The older the cordial gets, the more fizzy it becomes and the more ‘winey’ the smell. A very little goes a long way then – and it’s time for a new batch. A local herbalist of my grandmother’s generation would raise his hat to every elder tree he saw, because of its services to humanity. We use the cordial for everything from hayfever (that pollen content is useful!) to colds (hot), fever, flu,asthma, coughs, sore throat (a spoonful neat every hour) and whenever you just need to feel soothed. It really is a hug in a mug. I made lots of Elderberry cordial in the summer of 2012,i still have four bottles left.There is a blob in the bottle that looks like a cloud. When i shake the bottle it goes but soon comes back.Should i through these bottles away? I can’t tell you for sure, sorry. How does it smell? Theoretically it should be fine from 6 months ago … but of course there’s always a chance that some bacteria or mold got in there, or if the bottles weren’t sterilized before adding the cordial. I haven’t had cloudy Elderberry cordial myself – anyone else had this problem? I went to the liquor store and a bottle of an elderflower licquor sells for $60, yeah, if I could make my own, that would be awesome. Thanks for sharing, Amanda. Only problem is like Danielle, the lack of eleder trees around where I live. I’ve seen them before, but no so frequently. BTW, your website is so inspiring, I am just discovering, but already am planning to try some of the inumerous wonderful recipes you have shared with your readers. Thank you! could you use this recipe but replace the elderflowers for say, orange zest or something similar to make a different flavoured cordial?